LG took the wraps off the Optimus Pro G last week but the announcement was curiously devoid of any useful specifications. Now, the company has announced the phone for the Korean market and thankfully, there are now some specs for us to drool at. You may already be acquainted with the 5.5-inch, 1920 x 1080 resolution display on the Optimus Pro G, which LG says is the largest on any of its phones yet. The display is surrounded by a narrow bezel, which makes the phone 76.1mm wide, narrower than the Galaxy Note II, which is 80.5mm wide and has an identically sized display. Inside, the Optimus G Pro runs on Qualcomm Snapdragon 600 chipset, with a 1.6GHz quad-core Krait 300 CPU and Adreno 320 GPU, the first phone on the market to do so. Then there is 2GB of RAM and 32GB of internal memory, with a microSD card slot. The Optimus G Pro runs on Android 4.1, Jelly Bean. On the back the Optimus G Pro has an 13 megapixel camera with LED flash and on the front a 2.1 megapixel camera. With a new feature called Dual Recording, the phone lets you record a video with both the cameras enabled simultaneously, with the feed from the front camera inserted into the main video for a picture in picture effect. Lastly, the Optimus G Pro has a 3,140mAh battery with wireless charging support, which should hopefully be enough to power the phone long enough. 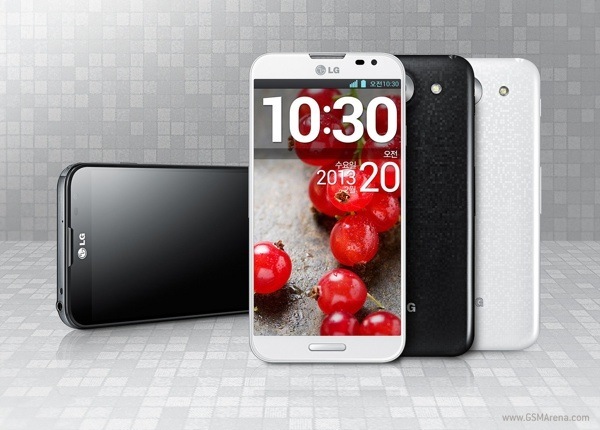 The phone will go on sale this week in Korea and will be displayed at MWC later this month. you just jealous ... admit it! wahahaha... lg congratulations...... you are the best mobile manufacturer ever since.... haters gonna hate lg as always... kudos lg! its 9.4mm thick far better than any other smartphone right now.